Playful, soothing, cosy—the Bright Starts Playful Parade Baby to Big Kid Rocker is the perfect cocoon for your little one. This versatile rocker grows with baby from infant to toddler, and can even be set to a fixed position for smaller babies, or to make a toddler chair. The Bright Starts Playful Parade Baby to Big Kid Rocker is great for comforting and soothing baby. This fun and friendly seat can rock back and forth to soothe baby, offering 2 reclining positions and full body recline for your little one’s comfort. The optional soothing vibrations add to the gentle rocking of this comfy seat, so lulling baby to sleep has never been easier. When naptime is over, the Bright Starts Playful Parade Baby to Big Kid Rocker is ready to play! 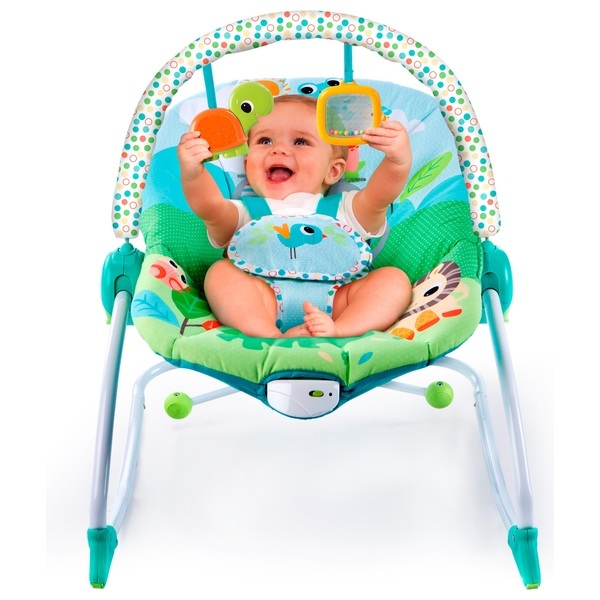 This colourful infant seat has a toy bar with two interactive dangling toys for baby. The toy bar can easily be removed so you can get baby in and out of the seat with ease. Removing the toy bar and using the rear kickstand to stabilise the seat easiy transforms this playful rocker into the perfect toddler chair. The cute animals featured on the Bright Starts Playful Parade Baby to Big Kid Rocker are sure to delight your child as they grow from infant to toddler! The seat pad is machine washable, providing soft, clean fun for years to come.